Szalai Nóri | 18. 12. 06. Ne feledd, hogy nálunk is elindult a karácsonyi őrület, lehet már ajándékutalványokat is kapni, sőt, a karácsony2018 kód segtségével most az éves nyomtatott 5 Perc Angol Magazin előfizetésének az ára 9540 Ft helyett 6500 Ft, amely szerintem biztos sok angolul tanulónak hasznos ajándék is lehet. Jó tanulást és kellemes böngészést kívánok a webáruházban! Italo was a dog without a master who used to stroll around the town hall square. Some say that he wandered into town after the death of his owner. At first, no one noticed him but then the locals started to get used to the dog, who entered the church to attend masses and took part in funerals and weddings. In a short time, he became the dog of everyone and the mascot of the city. It all started in 2009 when a half-breed dog, similar to a Labrador arrived in the city hungry and dirty. Soon he won the affection of everyone, accompanying tourists, stopping to wag with the children, attending weddings, funerals, public events of any kind (including political) and barking at passing cars to “his” no cars zone. He was always available to take selfies with everybody, who got near him. Although everyone was Italo’s friend he did have one special friend, a young man whom he used to meet at a bar every morning. One morning the unfortunate young worker had a fatal accident. Italo went to the church and kept vigil, lying by the coffin until the day of the funeral. He was also a local hero. One evening a waitress finishing her late night shift was attacked by a drunken man, but Italo was nearby and chased the aggressor away. After the incident, every night at 2 a.m. he would wait for her to walk her home. One day, unfortunately, he was hit by a car and the driver failed to stop, although he was unharmed there was a national outcry and through the wonders of social media, the lady driver out of guilt gave herself up. 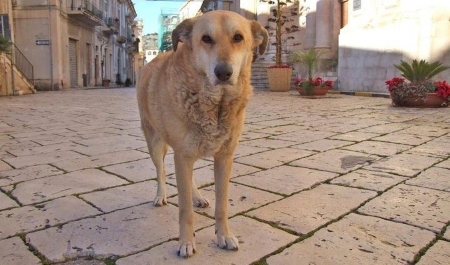 After the accident, the Mayor of Scicli prepared a kennel in the square next to the town hall and Italo was made an honorary citizen of the city. He was loved by everyone until the day of his death in 2011. He is buried in Scicli’s cemetery and his memory still lives on today. In his favourite bar, “italo BARocco”, there is a large beautiful photo of him, and on the wall outside and inside you can find lots of photos and newspaper cuttings about him. In 2014, his life was made into a film, an Italian romantic comedy that was filmed in Scicli and the surrounding areas.